Lancelot has found his forever home. Lancelot is a bit shy with men upon first meeting them, or if familiar men wear scary coats or hats. Well, normally that is true. However, this was not the case when Lancelot met his new Daddy. He went running with the other Pyrs to meet him, and was glued to him ever after this first meeting. Lancelot, although a lone dog before coming back to Marianne, and then to the other Maryanne's house to be fostered, thrives on doggie love and playing. 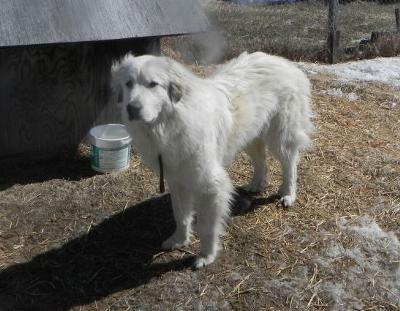 We are so thrilled that Lancelot - the ideal dog if ever there was one - will be going to a home with another rescue Pyr, and soon, with a child in the house, as he loves children. His new sister is about 3 years old, so he will have someone to wrestle and play tug of war with, as he has been exhausting Maryanne's older Pyrs. We wish Lancelot and his new human and canine family the very best, and we will visit! Congratulations to everyone. Love at first sight is a beautiful and heartening thing to witness first hand. Lancelot has come back to me because his human no longer has time for him. He is a gentle soul and very well mannered in the house and with other dogs. He is fine with children and cats. He knows his basic commands and usually walks well on a leash. However, once in awhile, he decides to investigate something different or to go in a different direction and then he pulls. Since he is very strong, he would need a refresher course to correct this. After all, he is only 20 months old and still a pup. I suspect that his owner did not have the time to consecrate to this last part of his training. He is a fine companion and very loyal. Typically Pyr, he examines a person minutely before deciding if he wishes to make acquaintance or not. If his cursory smell-over brands the person as acceptable, he accepts to be petted. If not, he will walk away. This is a wonderful boy for the lucky person he will take into his care. Voici le beau et gentil Lancelot, un presqu?adulte de 20 mois. Lancelot m?est revenu parce que son humain n?a plus de temps pour s?en occuper. Il est très doux et gentil, se comportant correctement dans la maison et avec d?autres chiens. Il est bien avec des enfants et s?entend avec des chats. Il connaît les commandes de base et marche bien sur laisse la plupart du temps. Toutefois, parfois il décide de vérifier quelque chose ou aller dans une direction différente et il tire à ce moment-là. Il est très fort est il faudrait un cours pour lui rafraîchir la bonne conduite en laisse. Après tout, il n?a que 20 mois et encore un chiot parfois. Je soupçonne que c?est le temps pour cette dernière partie de son entraînement dont son humain manquait.de temps. Il est un bon compagnon et très loyal, Typiquement Pyrénéen, il examine la personne très minutieusement avant de décider s?il veut en faire connaissance. Si son examen olfactif s?avère acceptable, il se permet d?être câliné. Si non, il lui tourne le dos et s?en va.
C?est un formidable chien pour la personne qu?il prendra sous ses soins! I'm the prospective adoptive for Lancelot and I can't even begin to tell you what a great dog he is. We bonded from the minute I walked in the door(literally) and he hardly left my side for the entire time of my interview. Apparently this behaviour is quite rare for him but like I always say - Pyrs tend to pick their owners rather than the other way around. I already have a 2.5 year old pyr rescue who is the sweetest girl ever and I can't wait to see the two of them together. I remember Ralph! He's a big wuss. I think that Lancelot would actually get along. It does happen that two males don't but that is usually when they are intact. These two are really nice boys and I see no reason that they wouldn't. If you want to know more, please contact me at (819) 985-1044 or through the contact link at the GPCSO website. I meant they are NOT The "tail pulling" kind of children!!! He is so beautiful!! 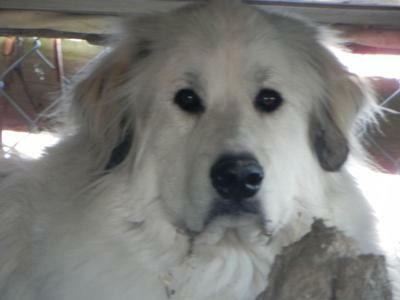 We adopted our now 4 year old Pyr from Carol about 2.5 years ago. His name is Ralph and he has been an absolute delite. We were thinking of possibly getting him a friend but are not sure if 2 males would be happy together. Ralph is not dominant and is very sharing of his home. We have a bunny, a 2 year old and a 4 year old. They are very respectful of animals and are not "tail pulling" kind of children. I also had a Pyr growing up and am absolutely in love with the breed. Are you in Acton still? Lancelot has come to live with me as he is a house dog. He is an excellent dog. I cannot believe he is not even 2! Quiet, polite, mannered, affectionate and loving. This is quite easily "the perfect dog". Just a delight. Everyone - dogs, cats, kid, husband, housemates - loves him. Thanks for allowing us the pleasure of having Lancelot in our home.